We're quickly approaching the 150th anniversary of Henry Ford's birth, and the company he founded is celebrating in a number of ways. 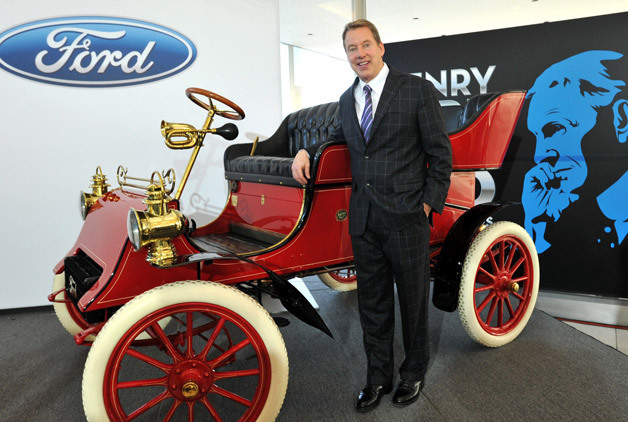 Great-grandson Bill Ford Jr. did his part by purchasing the oldest known Ford vehicle, a 1903 Model A, and returning it to its birthplace. While the Model A was purchased at auction back in October, the red Rear Entry Tonneau just recently received an official unveil at an employee event. Ford partnered with the MotorCities National Heritage Area and the Henry Ford Heritage Association to create a year-long calendar of events celebrating Henry Ford and his company. This particular Model A is car number 3, chassis number 30. Prior to rejoining the Ford family, it had enjoyed just five owners in its 109-year history. Originally sold to a butter maker from Iowa for the princely sum of $850, the Model A was sold to a Swiss Ford dealer in 1961. The dealer displayed his purchase in the Ford European Center in Cologne, Germany until 2001, when it was finally sold to John O'Quinn in 2007 before Ford Jr. took possession this year. Bill Ford Jr. brings oldest surviving Ford back into family fold originally appeared on Autoblog on Sat, 15 Dec 2012 08:00:00 EST. Please see our terms for use of feeds.